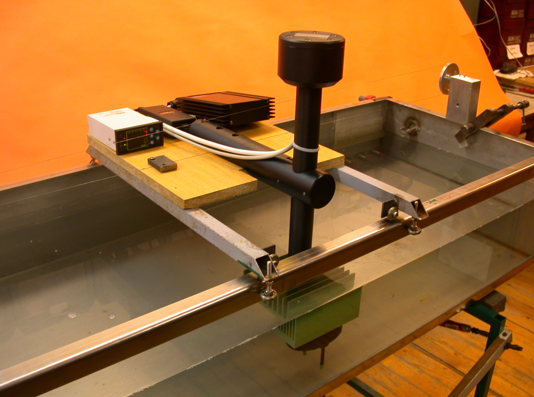 The most modern fish feeding system, developed by a Hungarian company, consisting of a network of individually operated feeding machines. 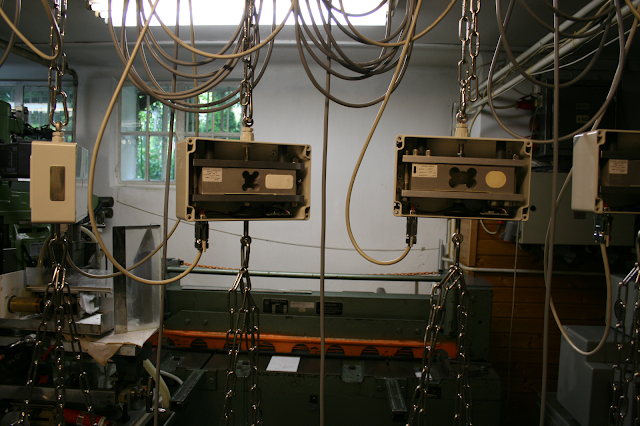 The feeding machines are hanging on stainless chains, fastened to expellable brackets over the fish tanks. 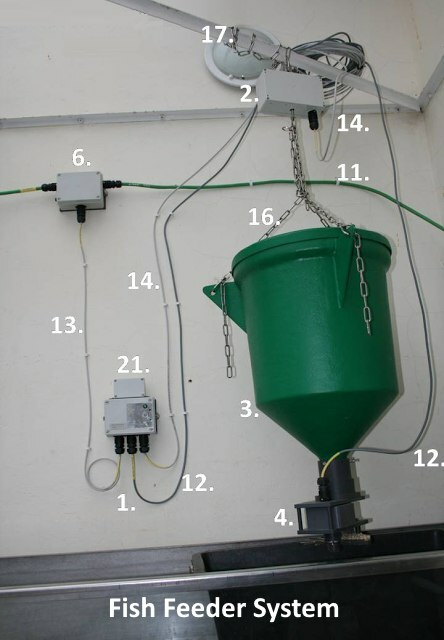 The electronic scale is attached to the hanging point, followed by the fish food bunker, and the feeding mechanics which is mounted to the food bunker lower funnel-shaped end. 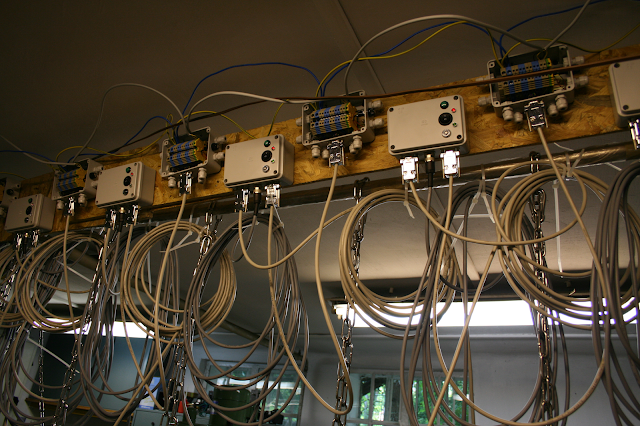 The dosing is controlled by a microcontroller with an individual IP address assigned to each feeder. Each microcontroller has its own 12 Volts local battery in order to protect against network overload caused by random simultaneous feedings. Especially given the fact that maximum 93 feeding units can be integrated into a system. The entire system runs on a 24-Volt central battery. The central battery is supplied from the heavy current network by a trickle-charger. The PC connected to the system has no direct effect on the control. 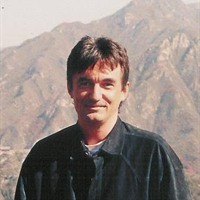 The PC has verifying, reporting and editing functions. The continuity of the record is provided by the PC's UPS. The manufacturer intends the system for the global market, and has fulfilled the following requirements for all phases of development. - Can be easily installed by the customer (without the help of the manufacturer). - All the main pieces of the system; including the connecting cables, are provided with identification numbers. - The cable connections are unique and cannot be interchangeable. - The operating software CD, Pen drive, can be easily installed on the PC using the Internet. 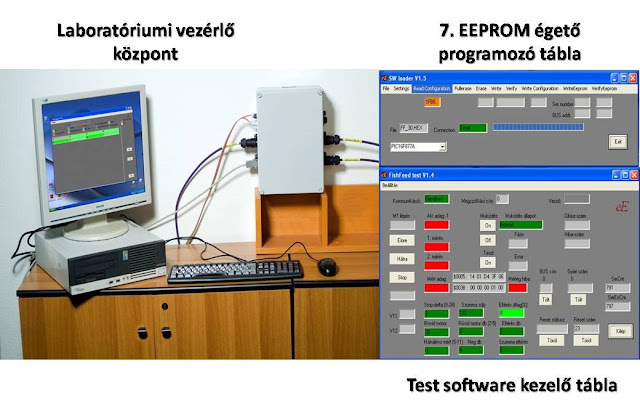 - The programs written in the microcontrollers can be remotely modified to the user's needs with the help of the EEPRO cleaner / writer, developed for the device. - The system can be operated remotely via the internet using a laptop. - The company proposes to the prospective user to keep one piece from the most vulnerable main parts on stock, so that in case of a failure - without servicing or using tools, the user can repair the malfunction itself. After the fault has been rectified, the faulty main part is returned to the manufacturer for repair. - The repair can take place within 24 hours and the manufacturer will send back the repaired main piece by express delivery (EMS). - In principle, there are three main components that may require the manufacturer's intervention. 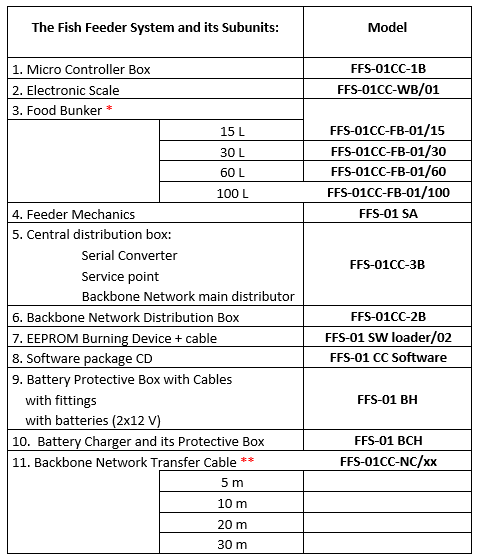 These are: the electronic scale, the microcontroller electronics and the feeder mechanics. - Since the PC and its accessories are not part of the control, they are only necessary when editing protocols and auto-logging. Therefore, PC errors should be solved using the local IT specialist. 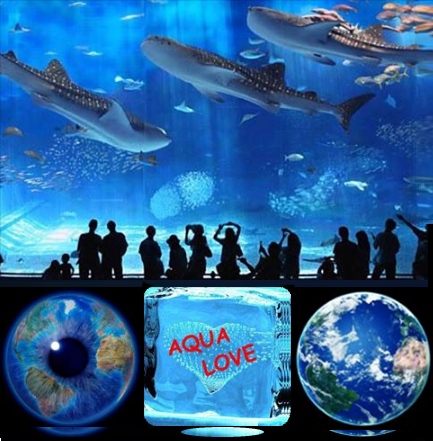 - As the fish-feeding system is intended for the global market, the company has found it very important to have simple language handling, especially in avoiding the misunderstanding of the functionality of the software. - Therefore, instruction and explanatory texts are displayed in any language from the device's language library, but the instruction set is executed in a window table format. The meaning of the windows are fixed in the language in question, but in the window only numbers can be written in, which are clear in the international scale. The manufacturer of the fish feeding system also manufactures other instruments and equipment for fish farms with intensive recycling technology. Such as compressed air supply system control, operational safety monitoring alarm system, etc. The above images show the calibration of the company's open water flow meter. This development was needed because the fish had fallen asleep after the meal, and the flowing water swept them, causing them to pile up in the top drainage grid of the pool, they did not get enough oxygen and then perish. If the device detects a decrease in flow, it starts the central alarm system. The above two images show the testing of 8 fish feeders in the early stages of development. Operation principle: The controlled feeder head is situated under the feeding-bunker which is mounted on an aerial electronic balance. The dosage accuracy is 1 gram. 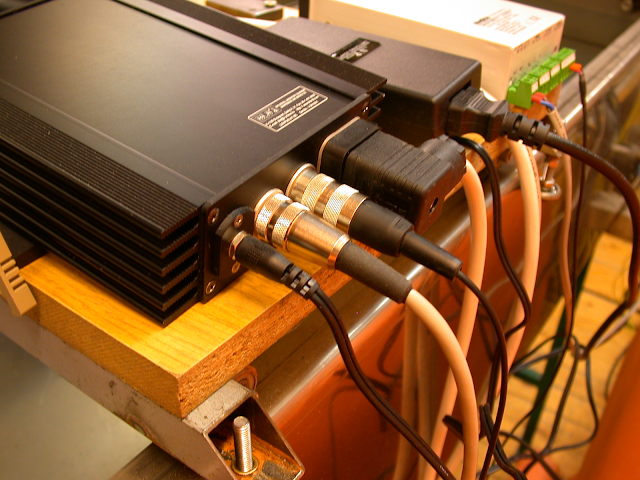 The feeder head is controlled by microcontrollers, which are operated by a battery network. 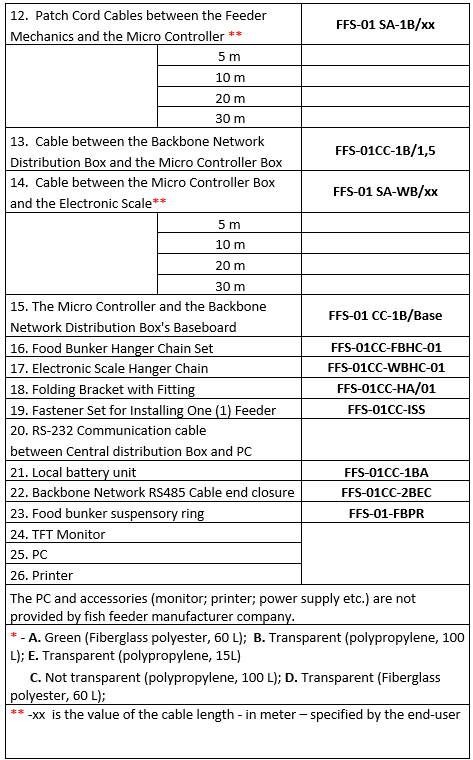 The central data collection is done by a PC, to which a maximum of 93 feeders can be connected. The aim of the fish feeder system development: to assure an economical plant operation in point of nutriment and labor force. 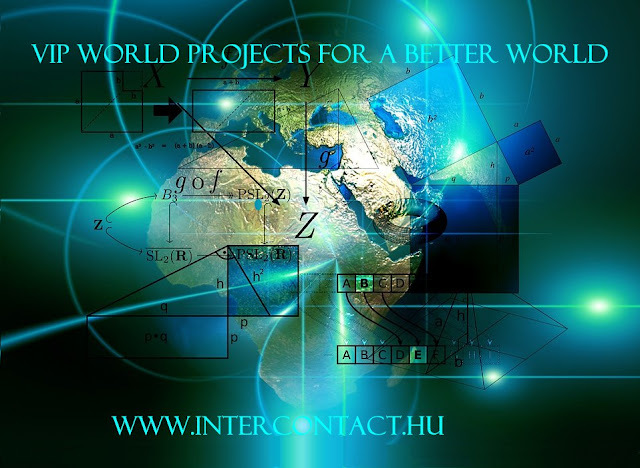 The water quality improvement of the recirculation system constitutes an extra benefit.